PARK SU-GEUN | Geringer Art, Ltd.
Park Su-Geun is a unique figure in the history of Korean modern art and is considered one of its most influential modernists. Because he was not formally schooled as an artist, Park Su-Geun is sometimes categorized as a naïve artist. Park Su-Geun was born in Jeong-lim-ri, Yanggu-myeon, Yanggu-gun in 1914. He attended Yanggu Public Elementary School and then taught himself painting as was a teenager. Drawn to painting by his affection for the French artist Millet’s “The Angelus,” a scene of religious piety set in the countryside, Park Su-Geun became known for his use of grey and soft tones to depict the themes and stories of Korean folklore. 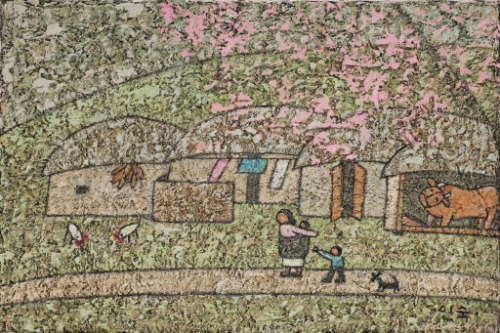 In 1932, Park Su-Geun made his debut in painting circles with his work titled ‘Spring Is Gone’ when it was selected for the 11th annual Seonjeon painting contest. He won a succession of prizes, starting at age 18, and became known for agrarian genre scenes depicting common tasks including farming. Another of his signature images is that of a woman carrying her baby on her back. He used a distinctive technique to enhance the surface of his paintings, building them up by repeatedly layering and scraping the paint. 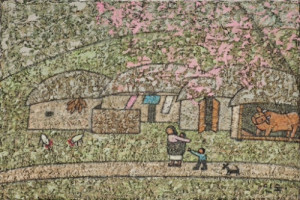 This technique was developed after Park moved to Pyongyang in 1940, where he encountered archeological photographs in reports prepared by the Japanese. He was particularly fascinated by the Goguryeo period rock tombs of Anak and their wall paintings, which inspired his characteristic stone-like surface. In 1945 Park Su-Geun became a teacher at Kumsung Middle School, and was affiliated with the emerging Communist party of South Korea. 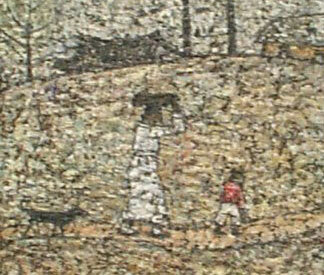 His paintings from this era display nuanced textures and a continuing interest in peasant subjects. As his reputation grew Keun’s work was exhibited in other parts of Asia including Manila. He and his wife were separated during the Korean War, but were reunited in Dongdaemun after the war. Although his family was often impoverished, the artist is remembered as a devoted father who often brought treats his five children. Following the artist’s death in 1965, he became truly famous on an international level. In recent years Park Su-Geun’s work has set records at international auctions, and his legacy continues to grow. Because of the value of Geun’s work, forgeries have been reported, and potential collectors are advised to be cautious about works that are not accompanied by strong provenance records.